Catherine Manoukian won the grand prize at the 1994 Canadian Music Competition at the age of twelve and has never looked back. 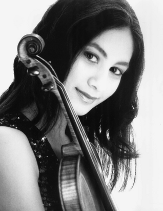 She was born in Toronto, began violin studies with her father, and made her first stage appearance at the age of four. From 1994 to 2000, Catherine studied with the late, world-renowned violin pedagogue Dorothy Delay of New York. Since her orchestral debut with the Vancouver Symphony at the age of twelve playing Paganini’s Violin Concerto No. 1, Catherine’s career has followed an impressive path. In recent years she has appeared as soloist with many major North American and international orchestras, including, among others, the CBC Vancouver Symphony, the Calgary Philharmonic, the Boston Pops Orchestra, the Toronto Symphony Orchestra, the Istanbul State Symphony Orchestra, the Tokyo Philharmonic, the Tokyo Symphony, the Osaka Century Orchestra, and the Armenian Philharmonic Orchestra, all received to great critical acclaim. She has collaborated with such conductors as Mario Bernardi, Jukka-Pekka Saraste, Keith Lockhart, Roy Goodman, Peter Oundjian, Marek Pijarowski, Tomomi Nishimoto, Seikyo Kim, and Eduard Topchjan. As a recitalist, she has graced the major stages of such cities as New York, Washington D.C., Boston, Los Angeles, Toronto, Paris, Tokyo, and has appeared as a chamber musician at the Aspen, Caramoor, and Newport International Festivals. Catherine’s four CDs (“Elegies and Rhapsodies”, “Chopin on Violin”, “Lyricism”, and “Catherine Manoukian, violin”), have been highly praised by critics and listeners alike. Her fifth CD will feature violin sonatas by Franck and Strauss.. In addition to her musical career, Catherine is currently pursuing a PhD in Philosophy, with full funding, at the University of Toronto. Her research is in the area of epistemology.